Never a truer word as (like the rest of the tour), these tickets immediately sold out when they went on sale last September, such is the demand to see this multi-media extravaganza. 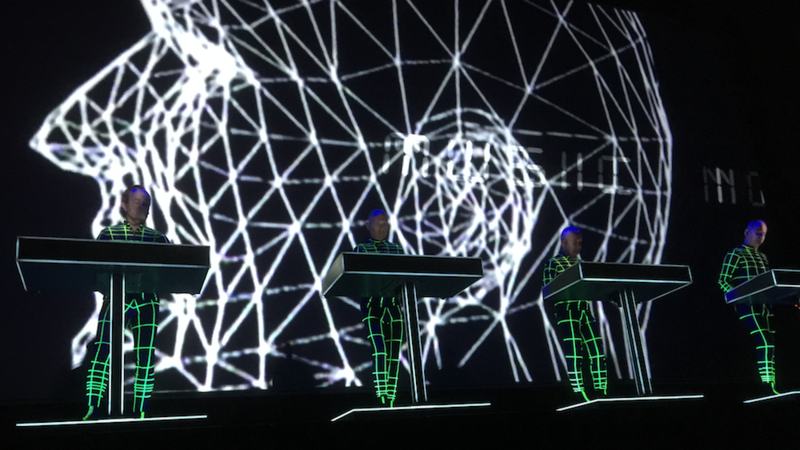 Some people/forums/blogs may think that Kraftwerk have become a pastiche of their former self, a cash cow homage to their past. I am not one of those people. Nottingham Royal Concert Hall, easily one of my favourite concert venues for atmosphere and sound quality, didn’t disappoint tonight. Luckily I was able to get front row tickets in the stalls and it took this incredible experience to the next level. The current line up consists of Ralf Hütter, Fritz Hilpert, Henning Schmitz and Falk Grieffenhagen (as the live video technician). 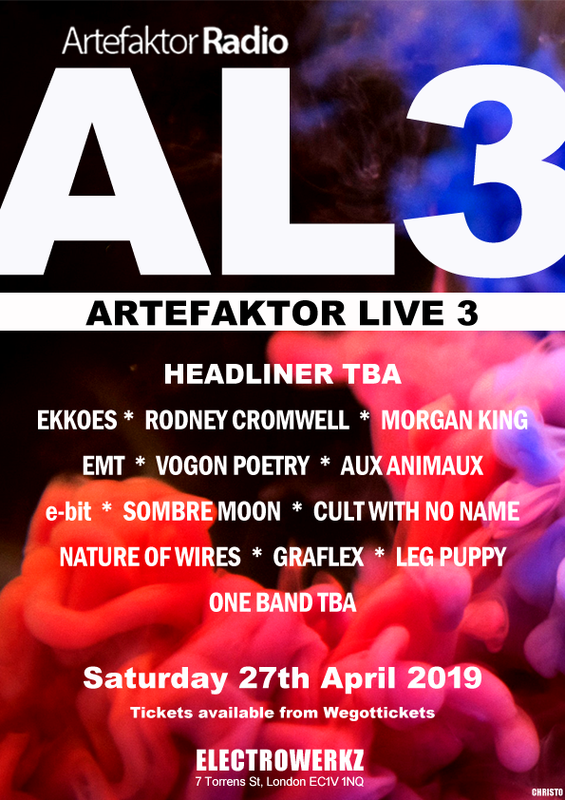 While Ralf may be the only original member left, the music was always so far ahead of its time that it is still futuristic and resonates in so many modern music genres. Arguably the most influential band of a lifetime? 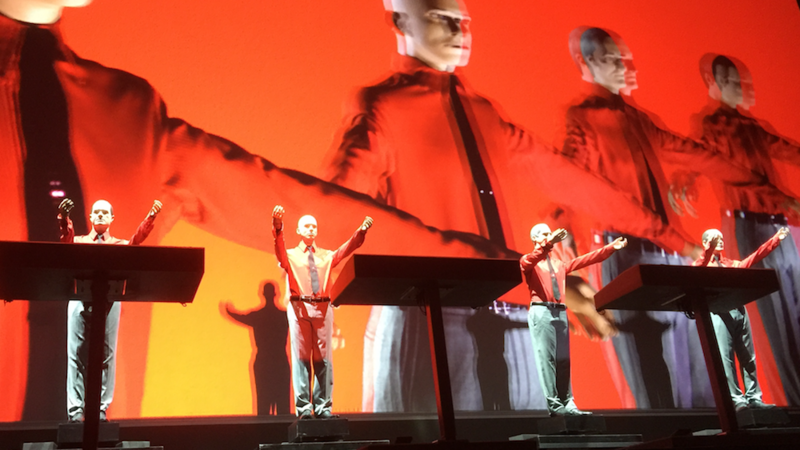 The last time I saw the Kraftwerk 3D experience I was awaiting an eye operation so the 3D never worked for me. No problems this time around. Entering stage-right to take their places on their control podiums in their Tron-style cycling skin tight suits, the wow factor of the opening track ‘Numbers’ brought gasps from the audience as huge neon numbers zoomed in and out of the screen, followed by an undulating blanket of ‘Matrix’ style numbers which then flew back and forth to the pulsating beats. ‘Computer World’ followed, this time giving a great depth of 3D with binary code as a backdrop and a floating computer in the foreground. Then into ‘It’s More Fun To Compute’ / ‘Home Computer’. Unfortunately, during this number, the 3D video changed to ‘Boing Boom Tschak’ / ‘Techno Pop’ leading to a few frantic moments by Falk while it was corrected. This proved that the video mixing was live and not just synched by machine, although to the casual observer it probably didn’t seem out of place. Once corrected, the colours and depth of the 3D were just astonishing – this was the sensory overload part of the evening which left you awe-inspired and breathless. ‘The Man-Machine’, those opening crystal clear notes that send a shiver down your spine, will surely go down in history, it sounded immense. “Super Human Being” never more apt. ‘Spacelab’ took us into orbit. The 3D imagery again played with our senses, as a satellite threatened to impale our eyes. It culminated in huge cheers as a 3D Google Earth image of the UK was shown with Nottingham highlighted, ultimately ending with a UFO landing outside of the concert hall. 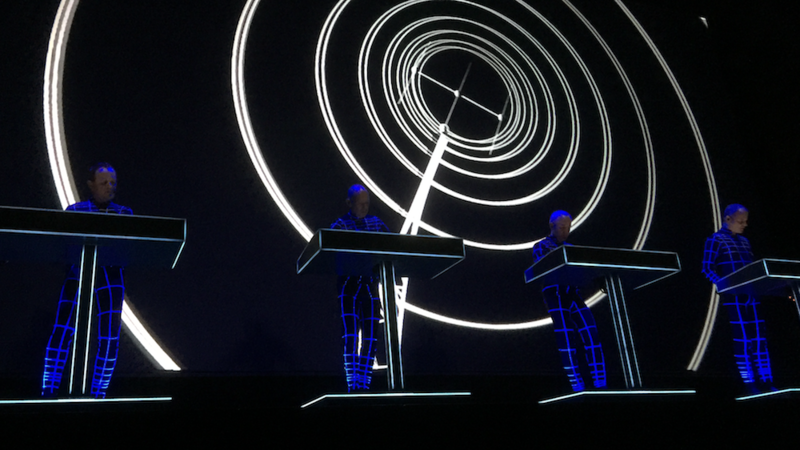 Kraftwerk had indeed landed, and the audience were eating out of the palm of their hands. No sooner had ‘Spacelab’ finished than ‘The Model’ started to huge cheers. The UK’s best-known Kraftwerk track was performed perfectly, Ralf’s vocals monotone but wistful. Then straight into the much-covered ‘Neon Lights’ – a sweeter neon love song you will never hear. ‘Autobahn’ followed, taken for a ride on the forenamed, full of retro graphics and again performed meticulously. Biggest surprise of the evening was ‘Airwaves’, beefed up to such an extent that initially it was only the visuals which gave it away. This version is a potentially pounding club classic and, at any other gig, the audience would have been on their feet dancing. We remained passively sat, but were dancing inside. I waited patiently for ‘Radioactivity’, my personal favourite track, updated now to include Fukushima and a verse in Japanese. I was left with goosebumps – it was one of ‘those’ concert moments. The cycling-obsessed ‘Tour De France’ 15-minute part of the set included ‘Tour De France’ / ‘Prologue’ / ‘Etape 1’ / ‘Chrono’ / ‘Etape 2’. While this couldn’t compete with the Manchester Velodrome performance in 2009 (when Team GB cycled around the Velodrome while the soundtrack was being played), it did bring one of the biggest cheers of the night. ‘Trans Europe Express’ / ‘Metal On Metal’ / ‘Abzug’ followed, the rhythmic pulses resonating through the brilliant acoustics at this venue. This brought the concert to a close and the Kling Klang Musikfilm logo appeared on the screen before the curtains closed. A return to Tour De France with ‘AéroDynamik’, possibly the best lighting of the neon lines of their suits – my chest vibrated with the bass from this. I felt the music. This was followed by ‘Planet Of Visions’ and then the finale of ‘Boing Boom Tschak’ / ‘Techno Pop’ / ‘Music Non-Stop’ (which we had been treated to the visuals to albeit by mistake earlier), with each member showboating in turn and then taking a spotlight bow and exit stage right until just Ralf was left. Being this close to Ralf showed a different aspect to his reclusive nature. Lots of smiles and subtle movement to the energy of the music, which I had totally missed before, made him (just a little bit) more human. Ralf departed with an “Auf Wiedersehen” and the 2-hour experience was over. In 1975 BBC Tomorrows World did a feature on the original line-up. 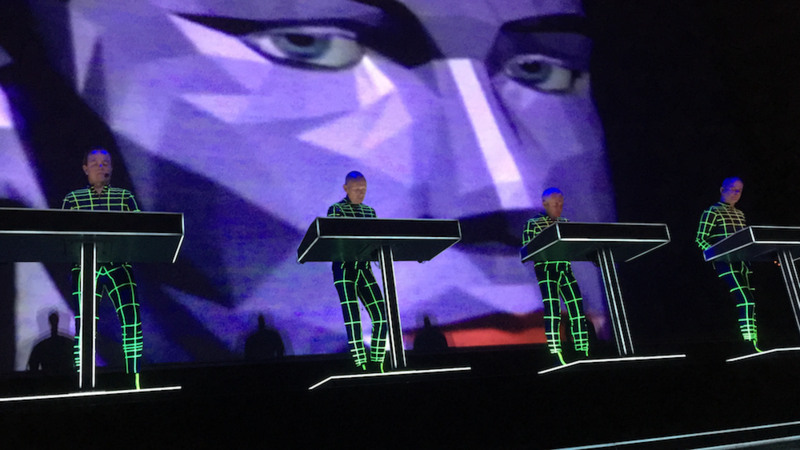 That feature ended with Raymond Baxter stating “Next year, Kraftwerk hope to eliminate the keyboards altogether and create jackets with electronic lapels that can be played by touch”. I wonder, back then, if Ralf could ever have envisioned the way they currently perform? I think he probably did, for I have listened to, and seen the future, and it is the past. All photos by Robert Rumbell.